Join the safe passing campaign with a simple lawn sign! passing law in Newark - using a shovel. 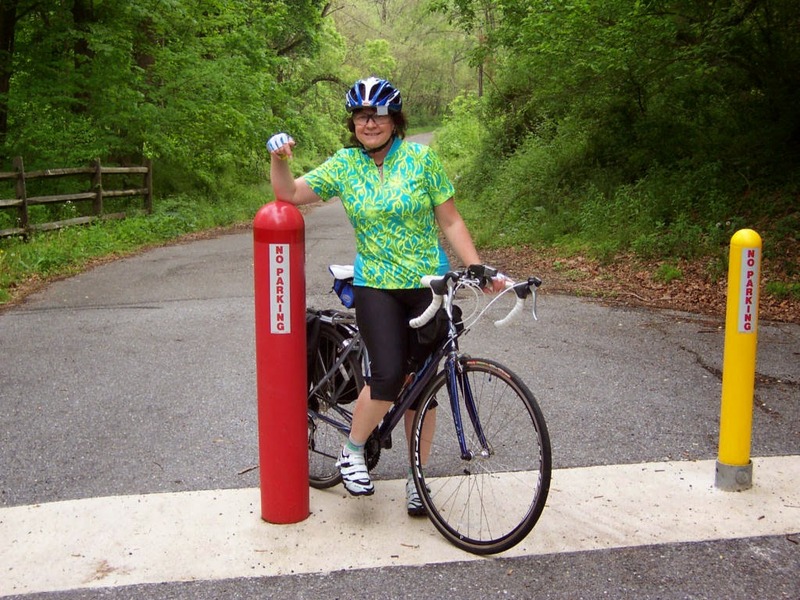 Amy Wilburn of the Delaware Bicycle Council, and Gail E. Robillard of the White Clay Bicycle Club have been working tirelessly on a safety awareness platform. At this time, Delaware has not put the funds aside for an education program dedicated to bicycling. But we won't let that stop us; a safety awareness campaign can also be funded by the private sector, and the interest is definitely there. From the litany of comments on WCBC’s Facebook page and list server over recent bicycling fatalities, using lawn signs to promote a safety message was the overall consensus. Safety PSAs using these signs - much like political campaign signs - have been implemented successfully by national and State motorcycle organizations. As a theme, it was determined that the 3’ passing law carried the strongest message. THIS IS WHERE WE NEED YOUR COMMITMENT! Those interested will be asked to place a sign in their front yard to help us get this message out. If you would like to participate, please email Gail with your full name and a full time contact number. As soon as the signs are complete, we will arrange getting them to you. Our target is to implement this campaign during May (Bike Month) which will increase our exposure, and have them available at Delaware bicycling events throughout 2015. By Angela Connolly -- It was with great interest that I watched this video, and read the article. I was especially curious, as these roads are part of my regular ride to and from Downtown Newark, and I ride them often. Even as a new cyclist, several years ago, I was not terrified to ride on these roads - only eager to learn from my mentors how to take my proper place on them. To support the need for this cycle track, this video presents Ms. Jones's view of cycling these roads, and while I agree that they can be challenging to ride, her behavior at times had me concerned. For myself, I have learned that in order to be safe, in Newark and anywhere else, I must ride responsibly and predictably. To me, that means cycling defensively, and anticipating different possibilities at all times. That means slowing down at crosswalks, especially around the busy University, or the Newark High School, and anticipating that I might encounter pedestrians. Pedestrians approaching the crosswalk are intending to cross, and must be yielded to. When sharrows are present, I ride right down the middle of the lane, keeping myself visible and out of the door zone. And when no sharrows are present, and I must take the lane to get where I need to go, I behave predictably - I don't stay near the curb unless I am intending to turn right. I don't hesitate or slow down in the bike lane when it is clear to move ahead. That sends mixed signals - where will motorists think you are going? Take your proper place on the road, and behave appropriately. And tell yourself this, as I have many times, while motorists honk at me and call me names - I am traffic. I belong here. It is my right to be in this lane. Put simply, if drivers are harassing and threatening bicyclists that are in the lane, the City and its police department are not doing their job (we already know that DMV - here and nationally - are not doing their jobs in terms of education and re-testing). This isn't to say it's always easy. Is it always safe? No. And it's not always fun. But when cyclists don't claim their rightful place on the roads, it sends a signal loud and clear that we are letting ourselves continue to be treated as second class citizens, and not valid road users. Whether we ride for recreation, transportation, or both, we have the right to infrastructure that encourages us, not scares us. And that includes on-road facilities as well as off road. And while I agree that trails, pathways, and cycle tracks do have a place in the overall network, they are only part of the solution. I feel like, instead of promoting the proposed cycle track, this article and video made a better argument for education and enforcement, both for bicyclists and motorists. 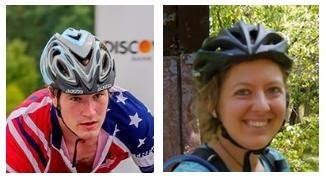 It was an eye-opener that made me look at my behavior, and the sometimes inappropriate behaviors of my fellow cyclists, as seen in the video, who sometimes need to be educated, and more importantly, encouraged to ride the roads. A cycle track won't cure those bad behaviors. The use of the word "terrifying" to describe cycling on our LAB designated Bike Friendly hometown newspaper's front page is discouraging, and inappropriate. And it undermines the positive efforts that the Newark Bicycle Committee, and other advocates, have put forth. Fear-mongering will discourage cyclists and keep them from cycling in Newark until years pass and the cycle track might be built. This is Ms. Jones's experience, and it does not reflect all of our experiences. Cyclists have been made to feel like they do not belong in traffic for too long. In summary, this proposed cycle track might be a good idea, but it won't immediately address the concerns of those who need to commute and navigate all of the areas of Newark. Even if the cycle track is built, there will have to be education provided, so that those who ride it will do so properly, with the proper etiquette. So in the meantime, as we anticipate Newark's first cycle track, it's also important that bicyclists remain a steady and accepted presence on the road as well. The author (not terrified) rides Delaware Avenue past S. Chapel Street in 2011. In its current condition, bicyclists need to have confidence and take the lane as needed, especially where the bike lane narrows across from the 7-11. 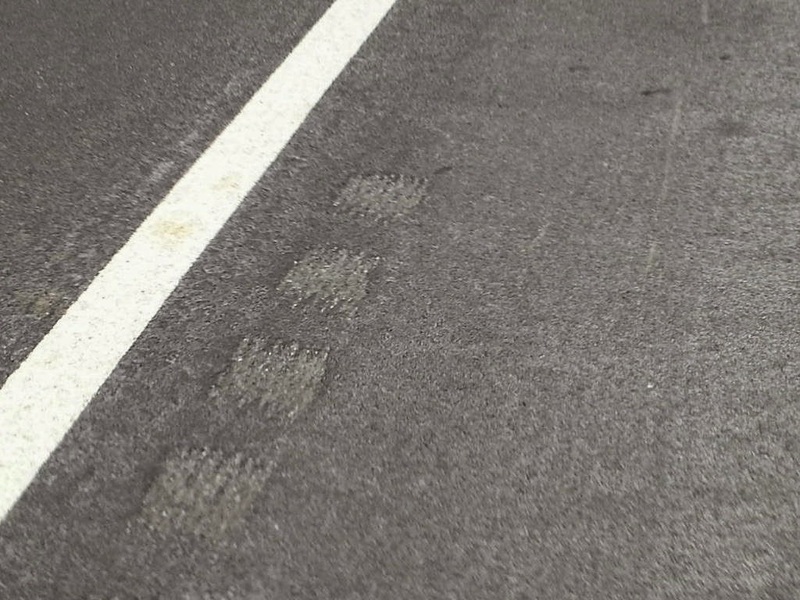 Surface conditions also demand lane control, as cracks and holes from shifts in the asphalt present a safety hazard. Lane control is necessary on many roads in Newark, especially those with sub-standard or door zone bike lanes. From the Newark Post -- Kirsten Jones is no stranger to the perilous Delaware Avenue bicycle lane. The University of Delaware graduate student uses her bike as her primary means of travel around Newark and estimates she treks down Delaware Avenue at least five times a week. In her daily travels on the road, she’s learned to be ready for anything: pedestrians stepping out into the street, cars abruptly turning in front of her, buses pulled over in her path and cars parked in the bike lane in front of Newark High School. “Those are pretty standard experiences,” Jones said, noting that she knows several cyclists who have been in accidents on Delaware Avenue. Delaware Avenue at the S. Chapel Street intersection in 2010. A brand new "pork chop" (concrete) island was recently installed, nudging bicyclists much closer to the lane of traffic than before. Poster's note: A cycle track segregates bicyclists from traffic. How they will safely negotiate intersections and other access points from within, that remains to be seen. Many advocates for education and enforcement oppose such facilities, because they reduce or eliminate the bicyclist's rights as a participant in vehicular traffic. "Bicycle-friendly" rumble strips that showed up recently along Route 4 in Newark are the correct width and depth to accommodate bicycling. They have the proper escape breaks to allow entering and exiting the shoulder as needed. But as we've come to expect so often with DelDOT, critical parameters were ignored or somehow missed. 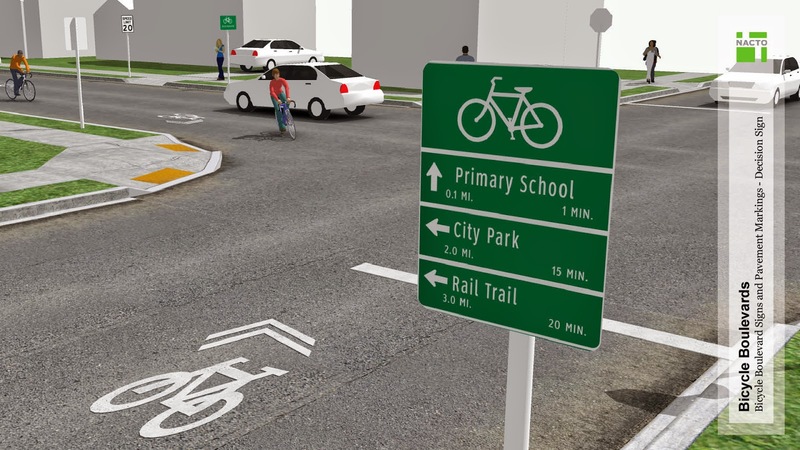 In this case, the offset from the white line is double the 6" specified in the drawings, that advocates hoped would put an end to this issue once and for all. To make matters worse, there was no sweeping of the resultant debris, leaving the remaining shoulder space a hazard in several places. 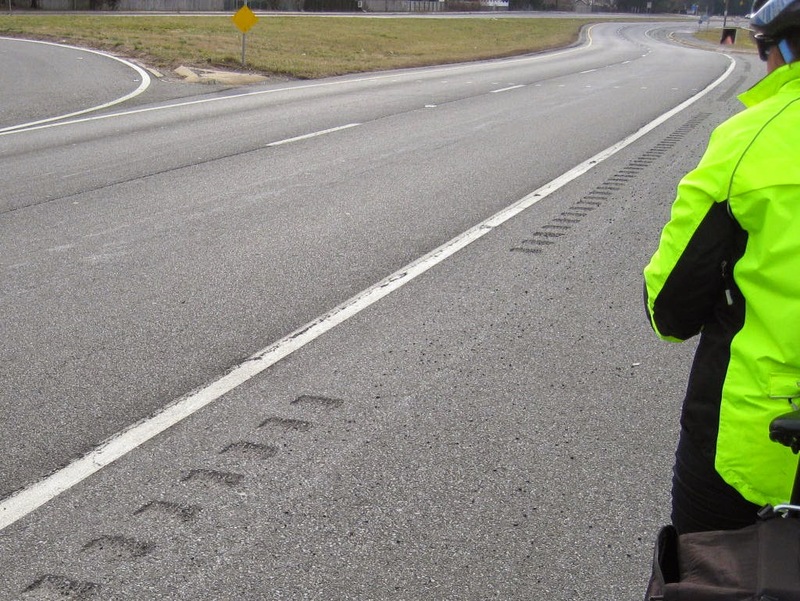 The latest round of Rumble Strips, found here along Route 4 in Newark near the University of Delaware, have an offset of 2x what is specified in DelDOT's newly adopted Bicycle-Friendly Rumble Strips guidelines. 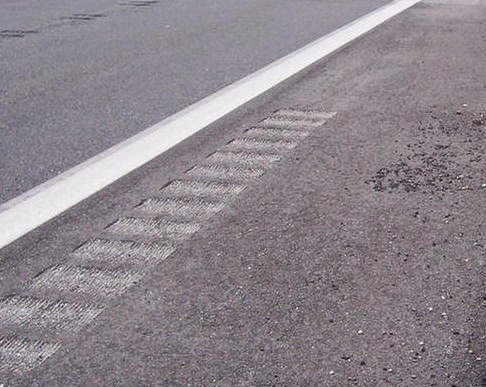 As described above, the design of the rumble strip itself is critical. But when it comes to safety, its position relative to the lane is at least as important - if not more important. 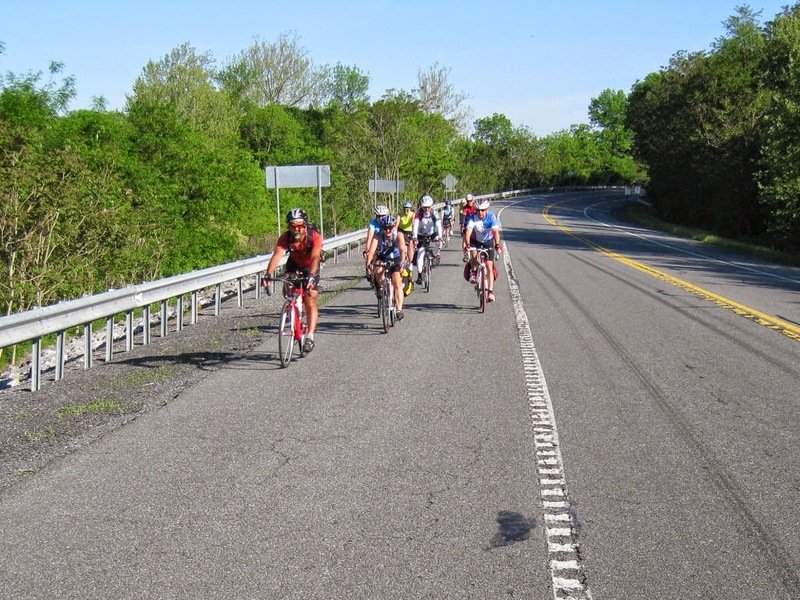 Bicyclists will still prefer to ride in the shoulder, behind the rumble strip. But the more offset it is from the white line, the less debris-free space remains. This will prompt more experienced bicyclists to ride in the offset, or take part of the lane (or the whole lane in this case) instead, to avoid tire puncture or loss of vehicle control. photo was taken in rural Pennsylvania. 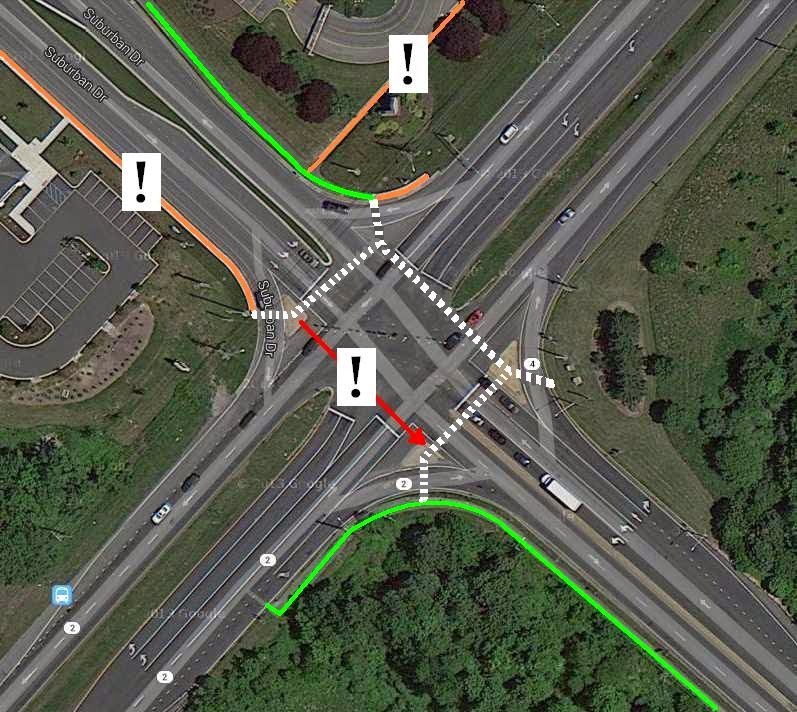 It is not clear why DelDOT keeps insisting on such a large offset - in this case, a foot or more. 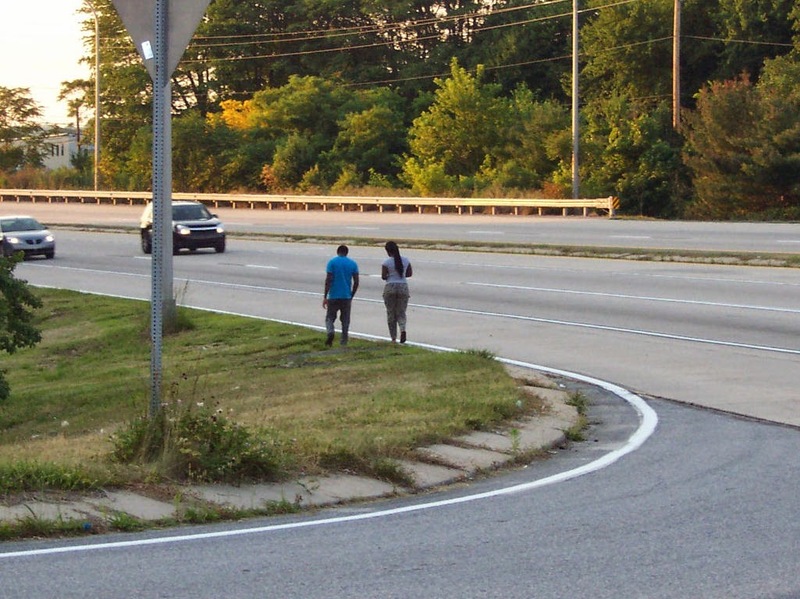 By the time a motorist senses contact with the rumble strip, they are well off into the shoulder and could be on their way to striking a bicyclist or other non-motorized user (pedestrians often walk in shoulders when no sidewalk is present). 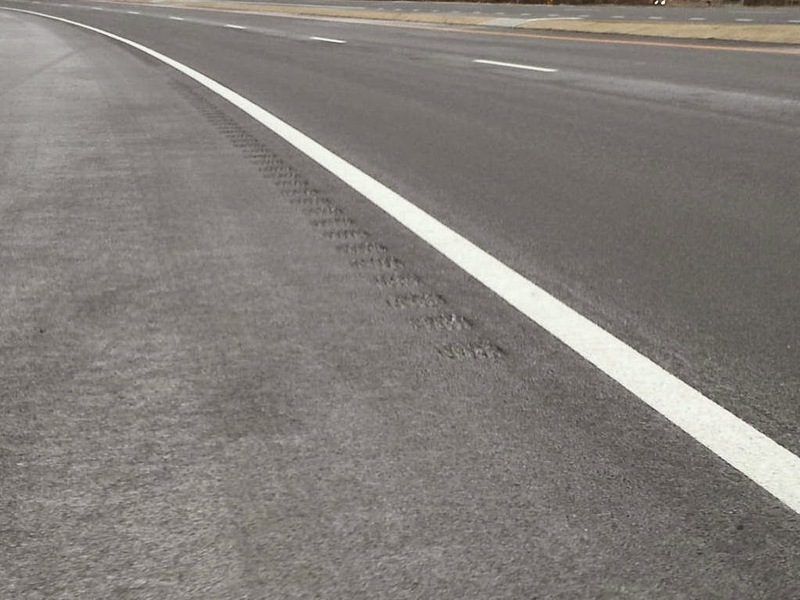 Some DelDOT officials have mentioned that edge-line rumble strips generate greater noise from more frequent contact, and thus, are disturbing to nearby housing developments. This is difficult to rationalize, however, given America's penchant for fake vehicle noise. Delaware's roads are disturbingly loud now, given what seems like every other vehicle having some type of illegal exhaust system. The police rarely - if ever enforce such noise, fines barely register, and it's not something people really complain about or it would be a recognized issue. In summary, we again thank DelDOT for revising the guidelines and giving us a much safer rumble strip. This is critical should bicyclists unintentionally ride into one, or need to exit the shoulder for any number of reasons. But we will not stop advocating that they sharply reduce or eliminate the offset, thus maximizing safe available shoulder space. To achieve compromise, the only thing we ask is that they follow the guidelines set forth in their newly released rumble strip design guidance, as they did here on Route 896 south of the C&D Canal. Co-authored by Angela Connolly -- Everyone who consumes fossil fuels is complicit in the destruction of our planet's ecosystem, and thus our life support systems (as well as that of millions of other species that share the planet with us). It can be difficult to acknowledge one’s own piece in the puzzle, however. Fossil fuels are at the root of industrial civilization, and the American way of life. While it's important to hold people, corporations, and governments accountable - especially when things go horribly wrong, prosecutions are rare. Nevertheless, pumping up one’s own frustration and aggression is generally not effective, unless channeled through an organized advocacy effort. It can also be harmful to your own health and well being. In the wake of the Gulf oil spill, and dozens of smaller yet similar incidents each year, you would think more folks would at least try to reduce their oil dependency. That and the dire consequences of climate change. 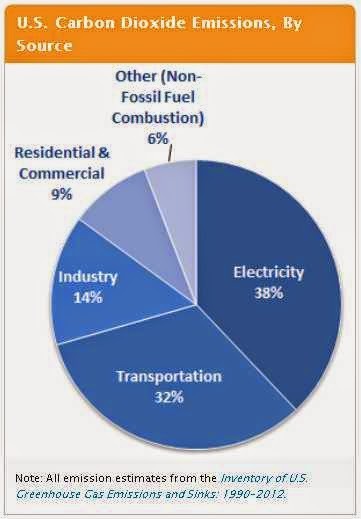 At 71%, transportation accounts for the lion's share of oil consumption, and is second only to electricity in emissions. Yet the car remains the overwhelming choice, even for the shortest trips. Here in Newark, we are an award winning bikeable (and walkable) city, yet a large portion of Main Street traffic is generated from adjacent communities, nearby student housing, etc. Trips that can be easily made on foot or by bike. Further disappointing is the lack of car-free or car-lite incentives that could be offered to students by the University of Delaware, as a means to reduce traffic congestion and improve quality of life. Like most - if not all American universities, this doesn't appear on their radar (certainly not in a Google search). Change your vehicle use patterns; use your car a lot less or not at all. Bike, walk, and/or use public transportation. If you must drive, be sure to have a fuel-efficient vehicle or car pool. 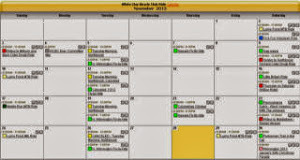 Aggregate your trips, so there’s 1 weekly shopping trip, for example, instead of 4 or 5. Reconsider and reduce travel by air, i.e. telecommuting, Skype, etc. Buy products that are produced locally, not half a world away. In the same vein, buy fruits & vegetables in season, and produced by local farmers (if possible). Buy used products instead of new ones, which will reduce oil use both in production and transportation. Goodwill, Craig’s List, garage sales, to name a few. Also, watch for usable items that people place out for the trash - you would be surprised at the items that can be found on the curb! You or someone you know might be able to use these items. Just make sure that there are no tags on these items marking them for donation to organizations such as the Purple Heart or Cancer associations. Otherwise, they are up for grabs! Eliminate, reduce, and/or re-use plastics, which are derived from petroleum. Reusable shopping bags are a great first step. Our oceans are filling up with plastic; plastic that harms wildlife and never biodegrades, and enters the food chain and leaches toxic chemicals. For those of you who enjoy crafting, here's a great idea to make items from "plarn", which is yarn made from plastic bags. Shopping by bike can be fun and easy. This errand included two rolls of carpet, Hibiscus, and a 6-pack. This article isn't to say everyone can just drop the car and switch transportation modes. Much depends on circumstances, including where we choose to live. But imagine the impact if more folks made just a small effort, perhaps commuting or running errands by bike or on foot just 1 day a week. I'm not counting on it anytime soon, though, with plummeting gas prices. 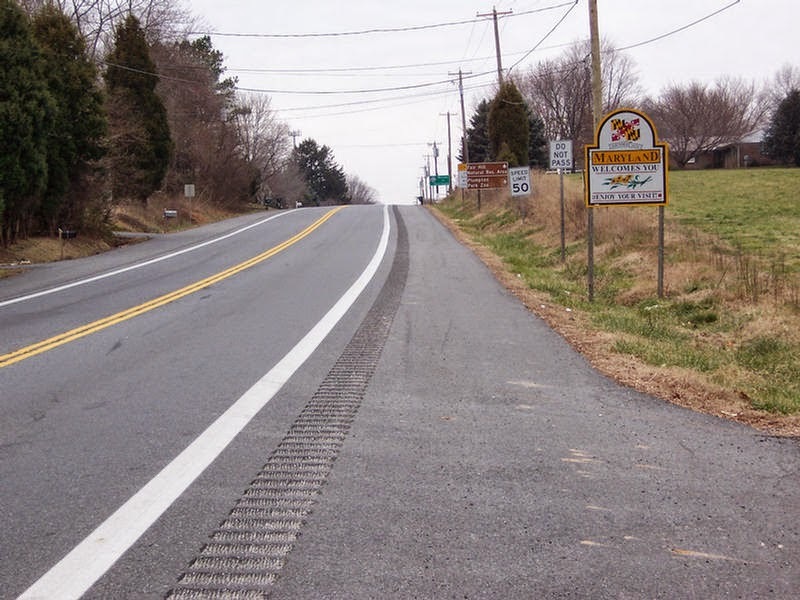 Just as Maryland's State Highway Administration worked with Delaware advocates on safer rumble strip design guidance, DelDOT also came through recently, as promised. 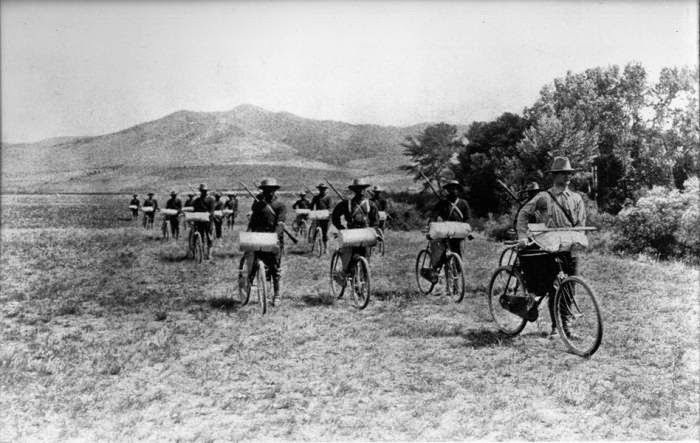 1st State BIKES advocates, as well as bicyclists from the Sussex Cyclists bicycle club were the first to discover the original design, which destroyed miles of usable shoulders. They were even placed in a few bike lanes. Once alerted, DelDOT dispatched crews to repair the damage in areas where the rumble strip reduced the shoulder to less than 4' wide. We sincerely thank the officials from both states who immediately acknowledged the problem, and acted quickly to revise the manuals and guidelines to include a much safer design. 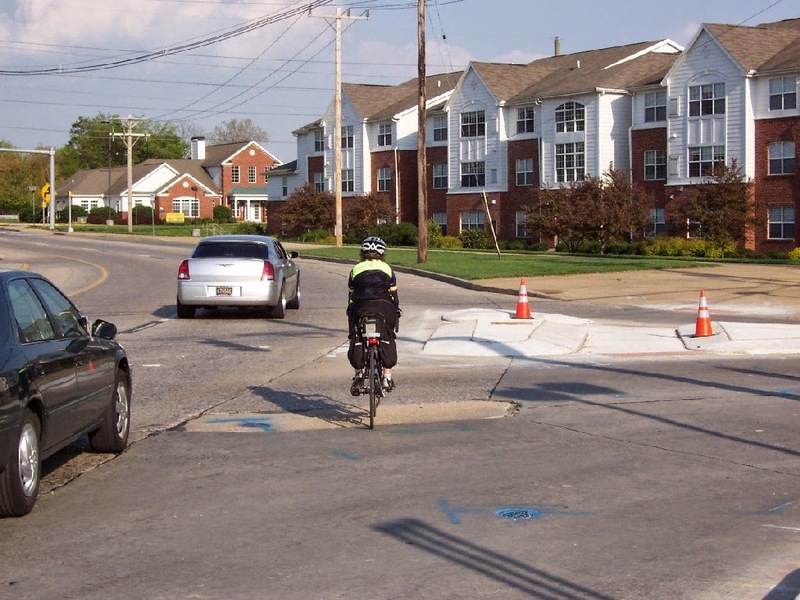 A huge tip of the helmet to Michael Jackson (MD DOT), Anthony Aglio (DelDOT Planning), Mark Luszcz (DelDOT Traffic), and several others who worked with 1st State Bikes advocates to make it all happen! Above/below: The new design, while not perfect, is a huge improvement. These rumble strips are shallower, narrower, and offset about 6" from the edge line. They also have regular breaks, allowing bicyclists to escape without hitting them. Even so, crossing this rumble strip is not nearly has dangerous or bone jarring as the original design. The offset is clearly visible here. 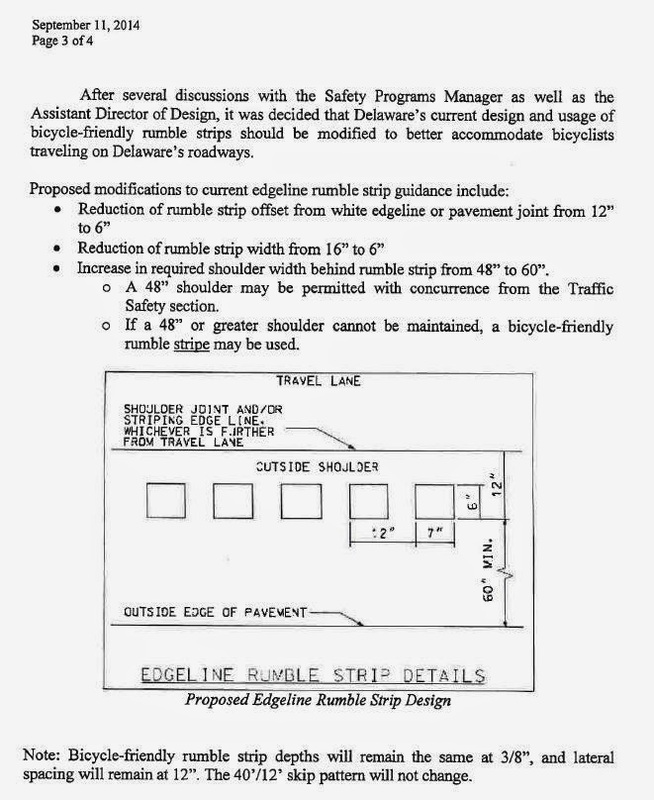 Despite our sincere gratitude for this design in the spirit of compromise, we will continue to advocate that rumble strips be placed at the white line, or as part of it, leaving maximum space for bicyclists to avoid debris and other hazards that sometimes appear in the shoulders or bike lanes. 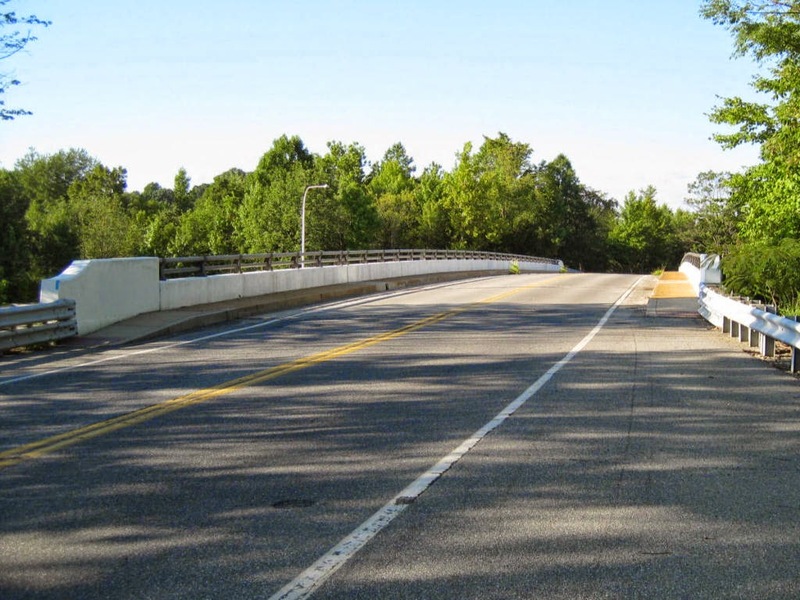 This is the design that was first implemented by Maryland's SHA, and then DelDOT. These were an absolute terror for bicyclists, being deep and wide and sitting exactly where bicyclists need to ride to avoid shoulder debris. The University of Colorado Denver is conducting a study about bicyclist behavior. They request your participation in this survey, which will take about 10 or 15 minutes of your time. Your participation is completely voluntary. The results of the survey will be used for research and planning purposes, and your responses are confidential. If you have any questions about this survey, please contact Dr. Wes Marshall (principal investigator) at 303.352.3741 or wesley.marshall@ucdenver.edu. If you have any questions for the Institutional Review Board at the University of Colorado Denver, they may be contacted at: (303) 724-1055 or COMIRB@ucdenver.edu. 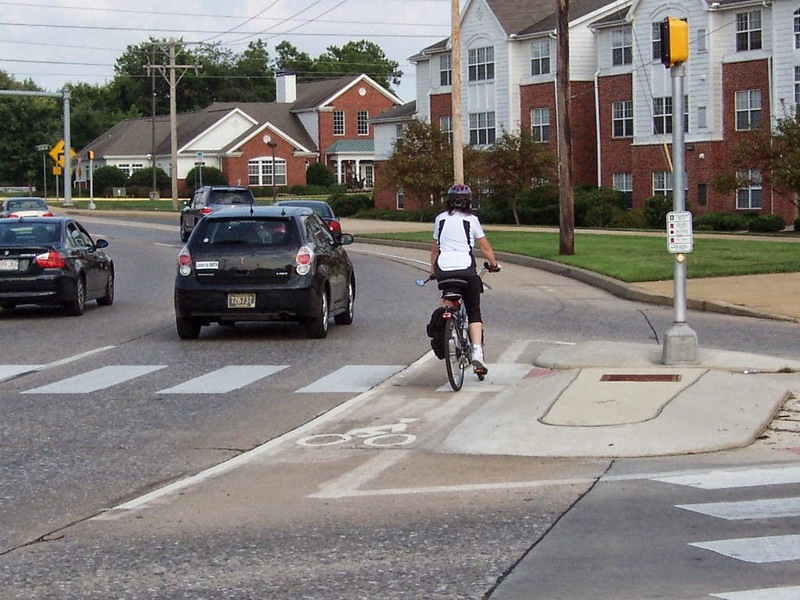 Poster's note: A few years ago, we conducted our own survey in Delaware, and the results showed that bicyclists would be less inclined to break the law if properly designed bicycle facilities were provided. Check it out here, including a link to the actual survey results. Check out the results of a study conducted in Portland OR, showing a 94% compliance rate. 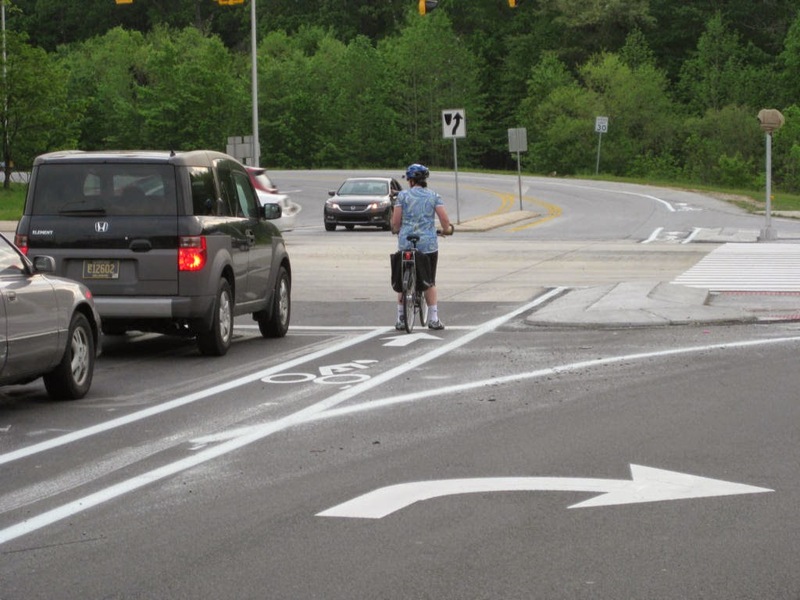 Surveys show overwhelming support for striping, signage, and other treatments that safely integrate bicycling with other road users. Properly designed, they should place the bicyclist in an optimal position against right turning vehicles, and never hug curbs or door zones. The above bike lane was added after the road was already striped for cars only; the erased taper lines can still be seen cutting across just ahead of the bicyclist in the picture. Cross-posted from WalkBikeJersey Blog -- While it has been frustrating for me to sit on the professional sidelines of bicycle and pedestrian planning, my recent job foray as a professional driver has given me the ability to see and observe a great deal of the real-world transportation environment of northeastern New Jersey. Recently I had to get the vehicle washed that I was driving at the Super Car Wash of Elizabeth on Rt 1 & 9 just south of the Bayway Circle. 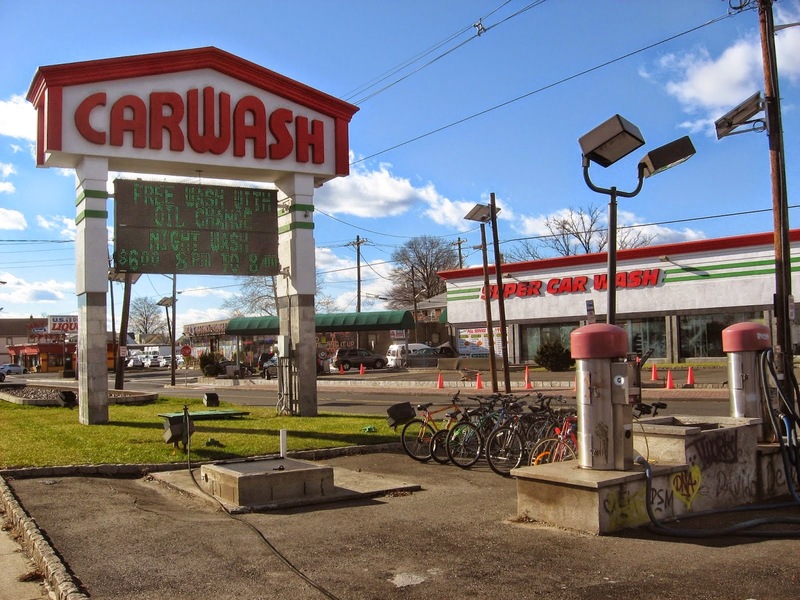 Super Car Wash employs an army of men to do the detail work of sweeping the inside of the car and drying it off everywhere when it comes out of the mechanized washed. Nearly all of these hardworking men are from Spanish speaking America. The scene outside Dover Downs Casino and Resort on Route 13 is very similar to the one described above. The racks are also of the wheelbending variety, however, commuters enjoy some peace of mind knowing the casino provides full surveillance. Please help us put an end to wheelbending racks in the New Castle County code once and for all, by signing this petition. 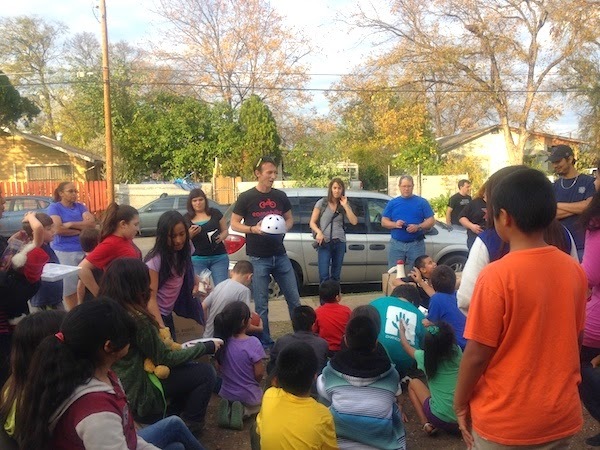 The San Antonio Earn-A-Bike Co-op (EAB) is a volunteer driven initiative with a mission to to create equitable access to bicycling by providing affordable bicycle maintenance, services and education. Their shop provides a central forum for sharing equipment, materials and expertise, and facilitates affordable, practical, hands-on support for cyclist of all ages and skill levels. EAB welcomes anyone who wants to learn about cycling, repairs, maintenance or safe riding. Aside from the pleasure of fixing and riding bicycles, members of the EAB believe that bicycles are vital for socio-economic gain, and offer an environmentally sustainable option to the automobile. The Earn-A-Bike program pairs those in need with skilled volunteers to rebuild and repair donated bicycles. At EAB, participation in advocacy would be encouraged. They view the co-op model as one that promotes cooperation from everyone in the community. If someone has a passion to advocate for policy, they can go forward representing EAB. 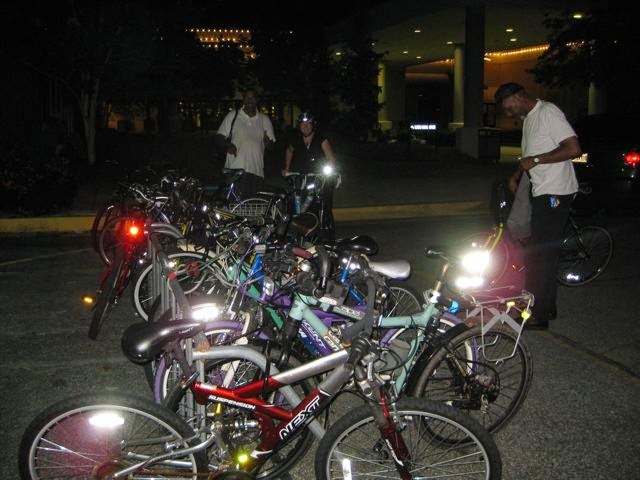 The organization would support the effort as long as it promotes bicycling and safety. In the words of Cristian Sandoval, Executive Director and Founder "We don't push our agenda, we prove our points. At the moment, we are tracking the benefits of implementing the Earn A Bike program in a lower income community as a means to reduce high school drop out rates and improve the health of the participant. If successful, we will publish and raise funds from the community to expand the program". In the spirit of giving and sustainability, EAB embraces researchers, advocates, philanthropists, writers, photographers, sociologists and other members of the community collaborating to prove the outcomes. Un-like the Newark Bike Project, events and activities must be bicycling-related, or they will not be considered. They even have a soldering class that uses old bicycle frames for labs and teaching. EAB rents their facility for $800 a month. Currently, the lease is volunteer paid, and will be until the organization is solvent - hopefully by the end of 2015. EAB operates with transparency and accountability in all aspects, including program planning and operations, finances, etc. Their primary goal is to provide equitable, affordable and practical services with a priority to those in need. In the interest of safety, Cristian Sandoval demonstrates the importance of using a helmet. Bicycling Magazine -- Almost every bike rider has experienced it: A hostile driver cuts you off, buzzes by within inches, or yells obscenities as you pedal. The experience is more than frightening - it’s potentially life-threatening. Unfortunately, cyclists have had little recourse. Until now. Ernest Ezis of Boulder, CO, was tired of hearing about riders being harassed by motorists with no way to warn their peers of repeatedly dangerous drivers. His solution? He created the Close Call Database, a website where cyclists can identify and track aggressive motorists. Rideye has the ultimate HD surveillance system, aka "black box" for bicyclists, that can record the details of an incident or accident. It can also catch a belligerent motorist in the act, and record the tag number. 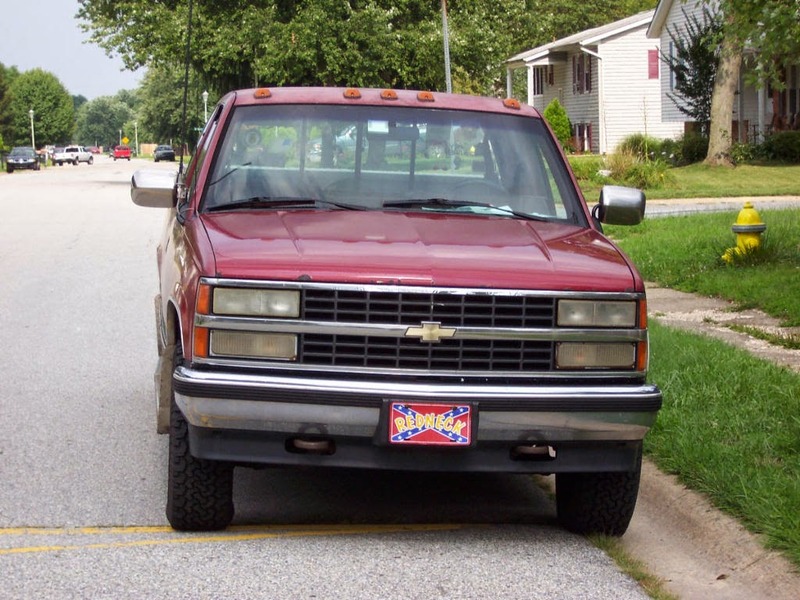 Unfortunately, because a front license plate is not required in Delaware, using a rear-facing camera (seatpost mount) won't be much help. New York Times -- Active older people resemble much younger people physiologically, according to a new study of the effects of exercise on aging. The findings suggest that many of our expectations about the inevitability of physical decline with advancing years may be incorrect and that how we age is, to a large degree, up to us. Aging remains a surprisingly mysterious process. A wealth of past scientific research has shown that many bodily and cellular processes change in undesirable ways as we grow older. But science has not been able to establish definitively whether such changes result primarily from the passage of time - in which case they are inevitable for anyone with birthdays - or result at least in part from lifestyle, meaning that they are mutable. 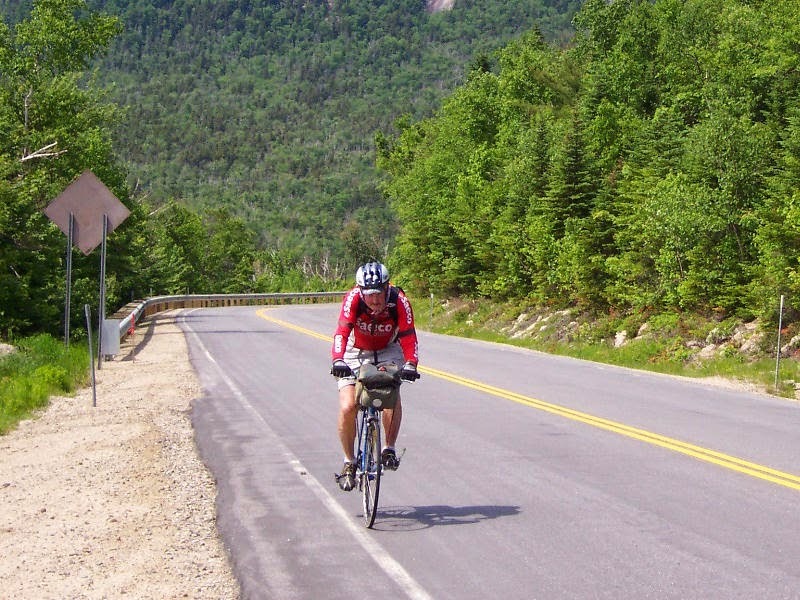 "Iron Man" Jim Eads powers his way through the White Mountains of NH in 2007. Jim will turn 80 in April, and thinks nothing of riding over 10,000 miles per year, every year. Check out this special interview with Jim HERE. 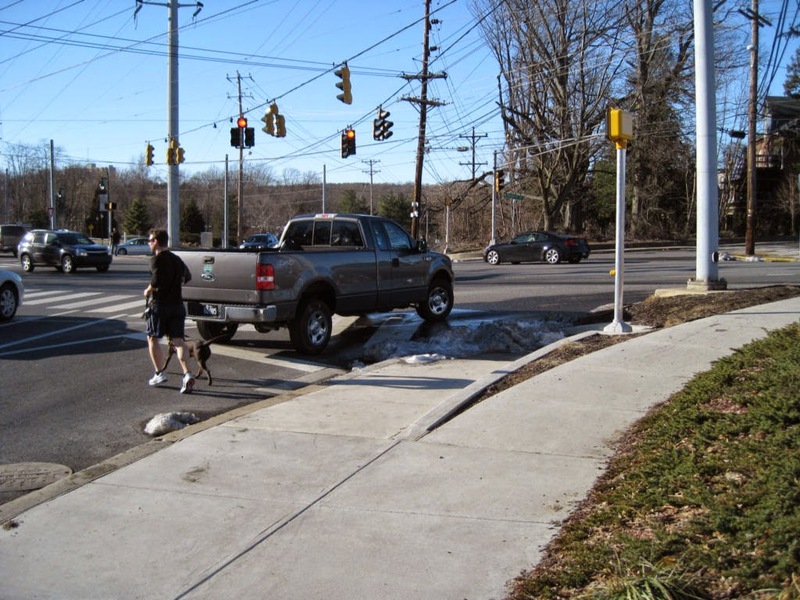 The Dover/Kent County MPO and the City of Dover will hold a public workshop from 4-7 p.m. on Tuesday, January 20 for people to view and discuss the final drafts of Dover’s Bicycle and Pedestrian Plan updates. The workshop will take place at the John W. Pitts Center at Schutte Park in Dover off of Hazlettville Road. For more information, call the Dover Parks and Recreation office at (302) 736-7050. Stop by and visit the event webpage HERE. Despite poor results with our petition drive, a new and unique bicycle warning sign is heading for approval. 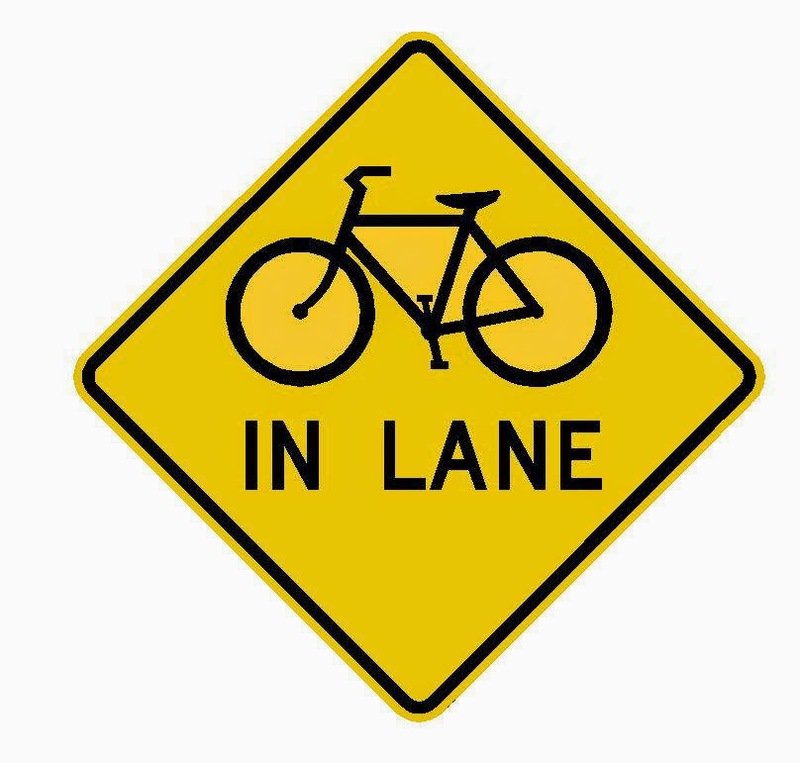 Working with 1st State BIKES advocates, Mark Luszcz (P.E, DelDOT) designed the sign that will give Delaware another 1st on the national stage, rolling out the words "IN LANE" in conjunction with the standard bicycle warning sign (bicycle symbol on yellow sign). Safe to say, this wouldn't be happening without a Chief Traffic Engineer who takes a pro-active approach toward bicycle and pedestrian safety. According to the Federal Highway Administration and the Manual for Uniform Traffic Control Devices (MUTCD), the bicycle warning sign by itself is used to indicate that bicycles are ahead, i.e. crossing or entering the roadway. But if you add a message in a sub-sign or "plaque", or in conjunction with the symbol on the sign itself, it then becomes useful for whatever the conditions dictate. Few will argue that something more is needed on non-shouldered roads with sub-standard width lanes. 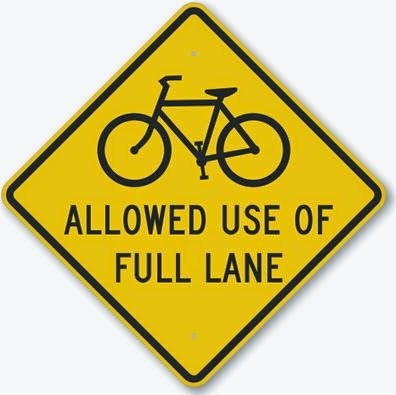 Something like a warning sign, yet carries an educational message that bicyclists are legally entitled to ride in the lane of traffic. 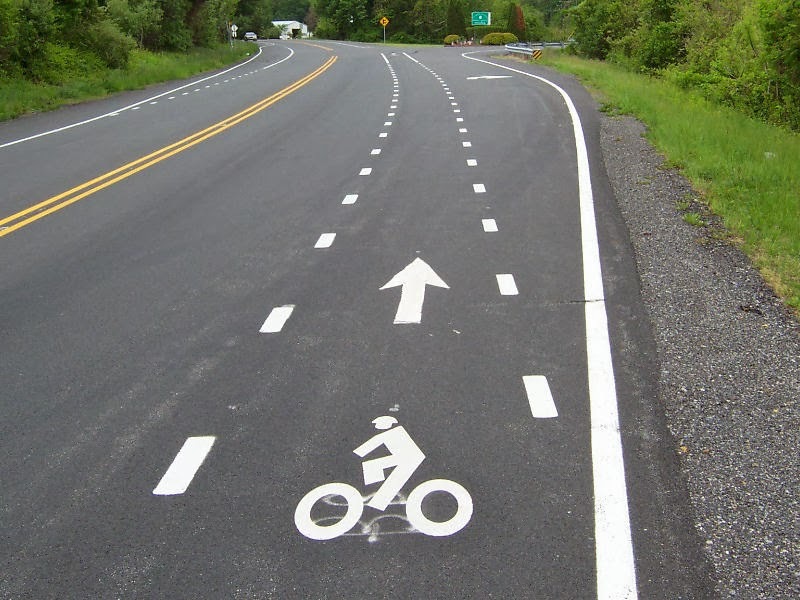 DelDOT had considered wider spread use of the "Bicycles May Use Full Lane" (BMUFL) regulatory sign, and tested it on Gills Neck - a 2 lane non-shouldered road in Sussex County. But it raised the ire of motorists and legislators, who claimed that bicyclists were abusing the privilege and deliberately impeding traffic. Under pressure, DelDOT removed the signs. Fortunately, a second location, at the bridge crossing the White Clay Creek on Papermill Road in Newark, is doing very well and will remain. Main Street in Newark is also working very well. Both are placed in conjunction with sharrows, of which have their own safety benefit. So it appears that DelDOT will limit use of the BMUFL sign to downtown environments and pinch points like the above. It has not yet been determined when the first "IN LANE" warning signs will be installed, but it should be in time for Spring. For pinch points, the following four I95 crossings were selected: Chapman Road, Salem Church Road, Otts Chapel Road, and Welsh Tract Road. Each has limited shoulders or no shoulder space at all, yet draw regular bicycle traffic because they are direct spans with no I95 access. Though Welsh Tract Road appears to have a narrow shoulder, it isn't usable. Occasional storm grates and debris collection, and a close proximity to the curb make it very dangerous to ride in. Safest position here is the traffic lane. Newark Post -- As the winter sun set on Monday, David Blickwedel was skateboarding down the James F. Hall Trail, even as temperatures dipped near freezing. The University of Delaware senior frequents the trail, as well as the adjoining Pomeroy Trail, several times a week. “You can go all the way to White Clay, which is great,” Blickwedel said. “It's also sort of nestled away from people, which I like.” Blickwedel is not alone. Even on the coldest days, bicyclists and pedestrians are seen on the Hall and Pomeroy Trails. 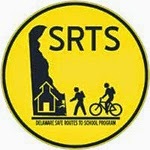 In early 2015, the Delaware Department of Transportation (DelDOT) will hold two "hands-on" Safe Routes to School (SRTS) workshops for all interested school administrators, physical education teachers, health/wellness practitioners and bicycle/pedestrian advocates. 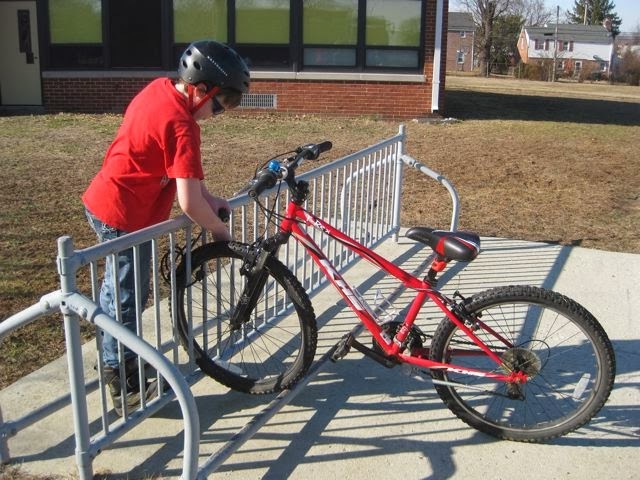 The purpose of the workshops is to provide participants the tools and resources needed to facilitate their own local Safe Routes to School programs, identify local projects for DelDOT Safe Routes to School planning and infrastructure grants, and conduct a school-based bike rodeo appropriate for grades 3-6. The first workshop will be held in New Castle County, with a follow-up workshop in either Kent or Sussex County. The format for each workshop will include a morning session on infrastructure planning, followed by an afternoon session on bike rodeo planning. Time would be allocated during each workshop for sidebar discussions and FAQs from trainees. Please provide your availability and workshop location preference for dates in March, April and May 2015. Based on responses, DelDOT will schedule the workshops and send out an official agenda. Connor Cunneely is the only child that rides his bike to Wilmington Manner ES. Much of the area surrounding the school is walkable-bikeable, so is this truly an issue of safety, or more one of laziness and/or lack of awareness? Interview with Connor HERE. Delaware’s rate of cycle commuting is lower than the national average. With tens of millions of dollars put into connected cycle pathways and shoulders, I found a mostly safe and easy way to ride my bicycle all the way from Arden, (near our northeastern border with Pennsylvania), to Newark, Delaware as part of my workplace commute. When I’d relate this at the bicycle shop I was working for to customers, most would stare at me with amazement, and ask ‘what route did you take?’ I explained that I was then having to explain the route as being in chunks of bike trail or along more notable landmarks, and that there was no official designation for this route. It simply said ‘bike route,’ and without using a GPS, I’d never have found out where each part went. Additional information regarding the various trails and locations they connect would only serve to encourage cycle-commuting, and would help cyclists relate to other cyclists which trails to visit, if each trail was given a name. I realized then that the only signage I had to go on was inconsistently present, and never once had spotted a destination list of areas the trail led to. bicycling, there is also no wayfinding signage whatsoever. Can you imagine driving your car down the interstate if the state never placed down any roadway signs indicating what the next city is on the road? Imagine if you also had no idea when or if the interstate would just end, effectively leaving you to have to turn around and find an alternate route to the city you are aiming for. This is a what cycle commuting can be like for beginning cyclists who are trying to find a route to and from work without the aid of a GPS. Some of the more major routes do have some small indicators at intersections. These small signs state which way to go to stay on the ‘bike route.’ What is not explained is what the route goes to, or if it’s best to exit the bike route if you are near your destination, or if the right turn will take you further from your destination, if it will duck into a neighborhood for a few blocks before continuing onward, or if it will only dead-end in a mile or two next to an expressway without warning. Sometimes indicators are simply a spray painted arrow indicating which way to go to continue on the trail (where the trail continues towards, it says not; it also says nothing of where the branch-off goes). There needs to be more information posted at each sign. What if we had consistent signage at every intersection, where branch-offs have neighborhoods labeled with signs for which neighborhoods and businesses they are servicing, along with any other connected trails listed. We could also use a mileage marker to indicate how far each destination is from the trail’s branch-off junction. The main line could then indicate remaining mileage towards its terminus or towards a major city, such as Newark and Wilmington, or proximity to other trails that the trail is headed to. Additionally, new riders would feel safer being guided towards a destination than having to make an educated guess based on the signs. The advantages of doing this are numerous; cyclists could have some understanding of where they are headed, which can only be a positive. Many cyclists choose to ride on segments of trails that are near their houses, but have no inkling of how far the trail goes, or that the trail might even branch conveniently into a place of work, recreation, or commercial site that they frequent. It is my belief that if we had better signage, more cyclists would become encouraged to travel further along them and aware of where they can travel on their bicycles. Delaware On-Line -- Transportation Secretary Shailen Bhatt is leaving Delaware after 31/2 years to head the Colorado Department of Transportation, starting in mid-February. 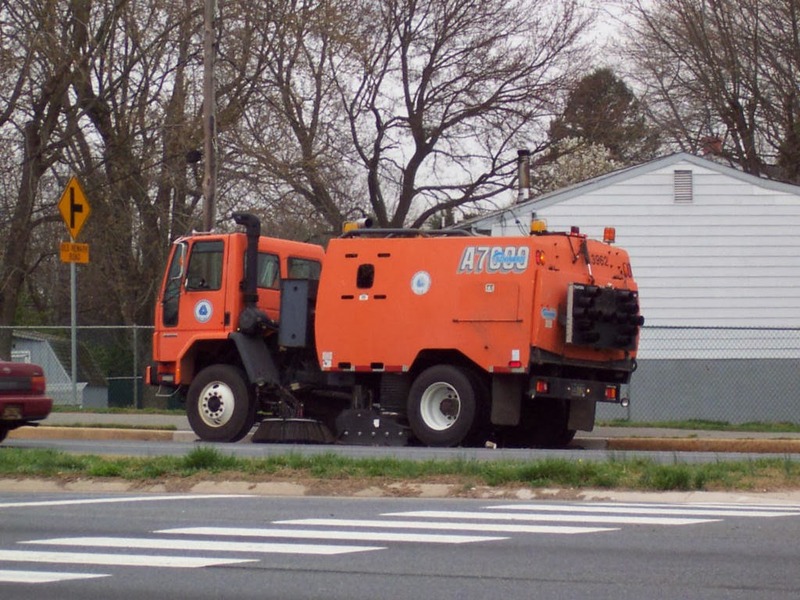 "I want to wrap up a revenue package for DelDOT before then. That's the biggest challenge," Bhatt said. "I want to ensure the transition is as seamless as it can be, and that I leave the agency in a good place." Gov. Jack Markell said Monday afternoon he's nominating Division of Motor Vehicles Director Jennifer Cohan to succeed Bhatt at the top of the 2,800-employee agency, pending her confirmation by the state Senate. Poster's note: We wish Shailen and his family all the best in his new endeavor. Colorado has some of the most bicycle-friendly cities in America. 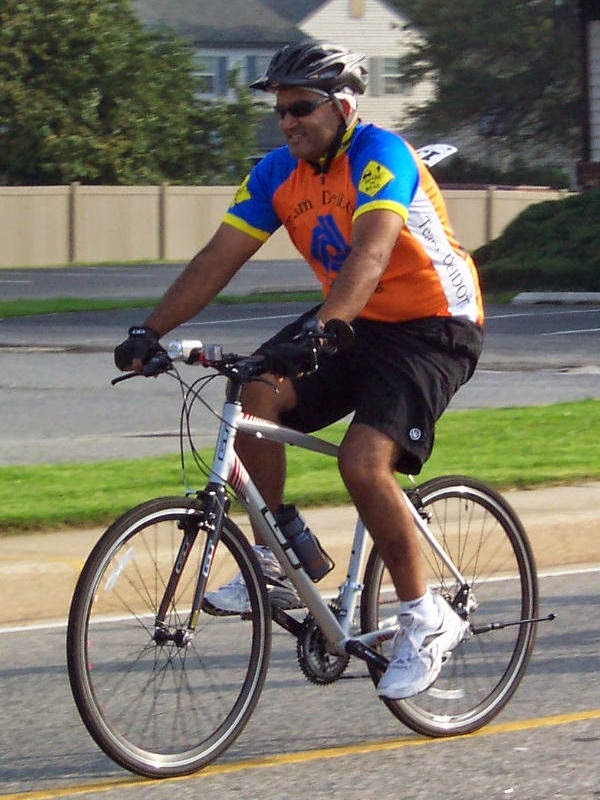 During his time DelDOT Secretrary, he presided over a more bicycle-friendly DelDOT and promoted the Trails and Pathways initiative. 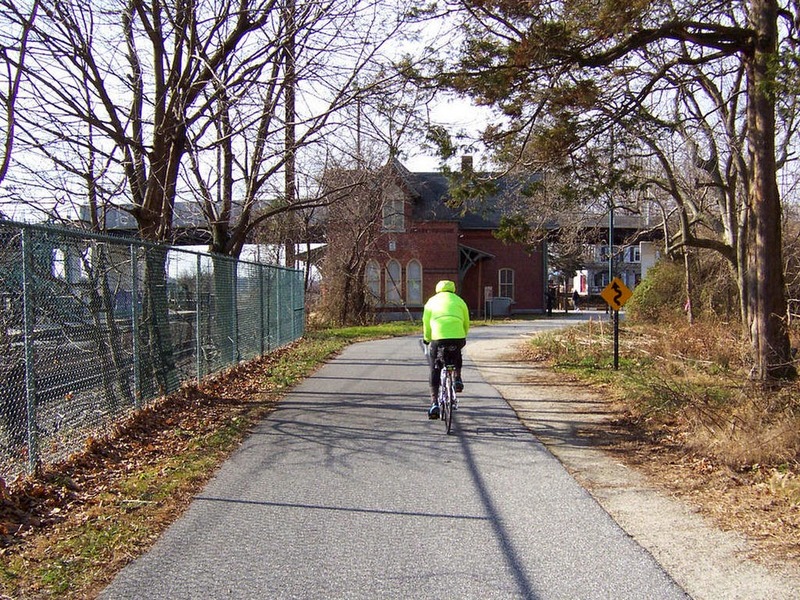 Most notably, he worked closely with Bike Delaware to expedite the completion of the Industrial Track Rail Trail between Old New Castle and Wilmington. What has made 1st State BIKES so successful in its first full year of existence? Our loyal followers have played a huge part. But we need more of you, in order to mature and become a true force in Delaware bicycle advocacy. And really, we shouldn't have any trouble at all, considering the popularity of bicycling and that we're not even looking for paid members. Supporting 1st State BIKES is absolutely free! And always will be. We launched 3 petitions in 2014. 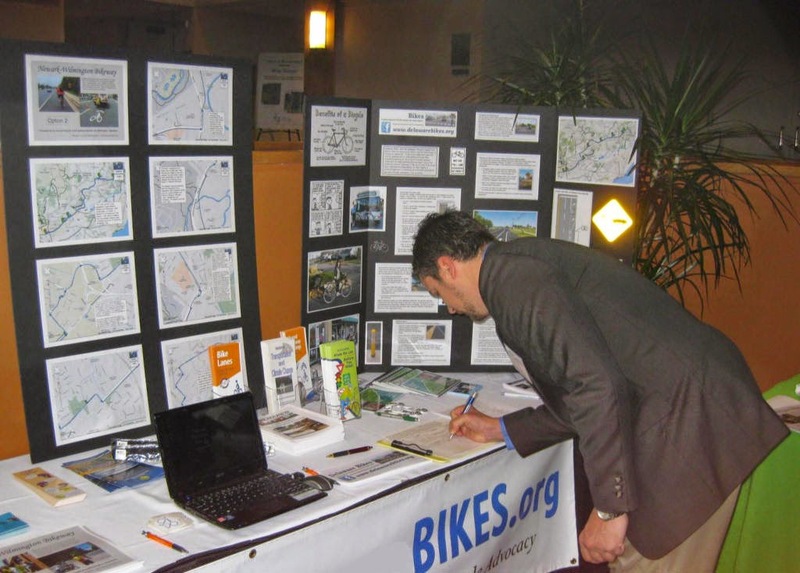 The first, advocating for a Newark to Wilmington on-road bikeway did quite well, clearing well over 200 signatures. As a result, several cyclists and three key folks from DelDOT rode the route. They took notes on the various obstacles, and many of the fixes involve some traffic signals, parking, and striping. Remediation could begin as early as Spring. Look for updates on this project as we get further into 2015. The other two petitions, not so well. We collected just over 30 for the Bicycle Warning Sign "In Lane" enhancement, and are still struggling below 15 for enforcement of New Castle County's Unified Development Code where bicycle parking is concerned. The latter is a truly dismal showing, and very discouraging when considering it involves equal level of service. Folks, we have to do better. Signing these petitions truly means something. The signatures are real, and collected in a printable form, and submitted to those in charge. Simply put, projects like this will fail if the bicycling community doesn't support them in the simplest terms. 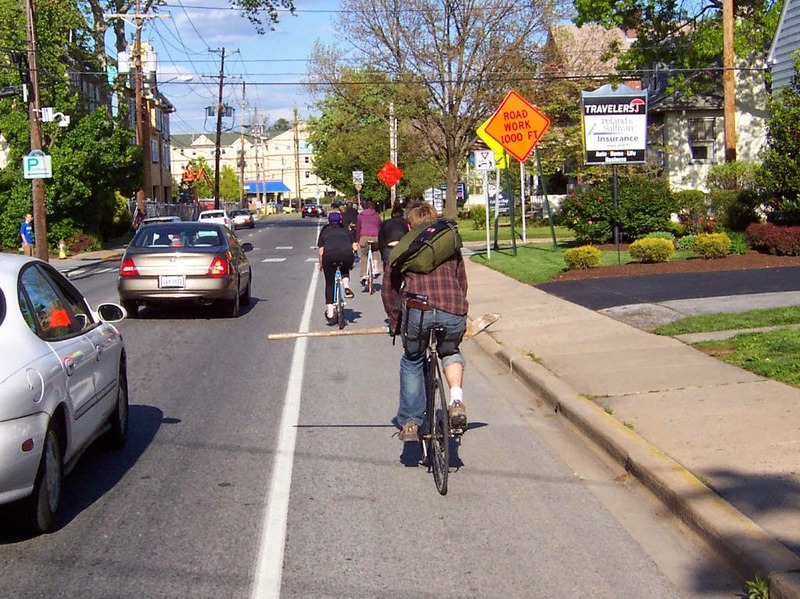 A huge barrier to gaining support is Bike Delaware. The State's #1 advocacy organization (according to the League of American Bicyclists) is not only ignoring our petitions, and not cross-posting our action alerts, but some of us are even blocked from posting on their Facebook page. 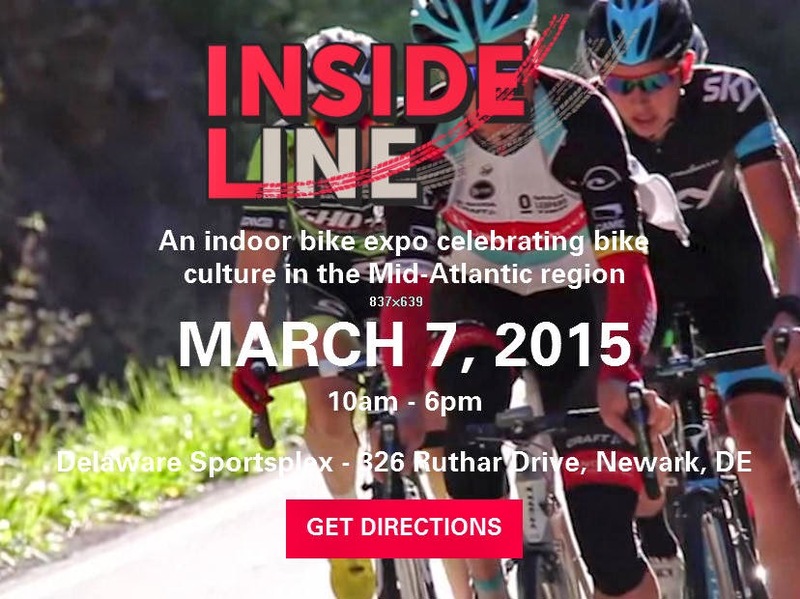 This, despite us promoting Bike Delaware's projects and programs. So we definitely have our work cut out for us, in gaining the support we need to not only defend current policies and legislation, but improve or add to what we already have. So please everyone, spread the word! Tell your friends to stop by and check out 1st State BIKES. Likes tell us lots about how we are doing, and we urge you to please invite your friends - via your own page - to like our page. We prefer to grow organically, as opposed to paying Facebook to grow fake numbers for us. On January 2nd, the 1st State Bicycle Corps launched a mining siege at the Iron Hill territory of Rittenhouse Park in Newark, Delaware. Light infantry, commanded by "Gunga" Gail Robillard, were sent ahead to clear a pathway and dig the first trenches. In the video below, Gail demonstrates invincible leadership skills, tackling rocks, roots, and even the trees themselves! Seriously -- Rittenhouse Park is a beautiful natural area with nearly 2 miles of natural hiking trails and access to the Christina River. It does not appear that the trails - 100% natural surface - are maintained well enough to recommend mountain biking, though it appears many do. The park looks small on a map, but feels quite large once inside. It contains substantial tracts of intact mature forest and is also a great place to go bird watching! 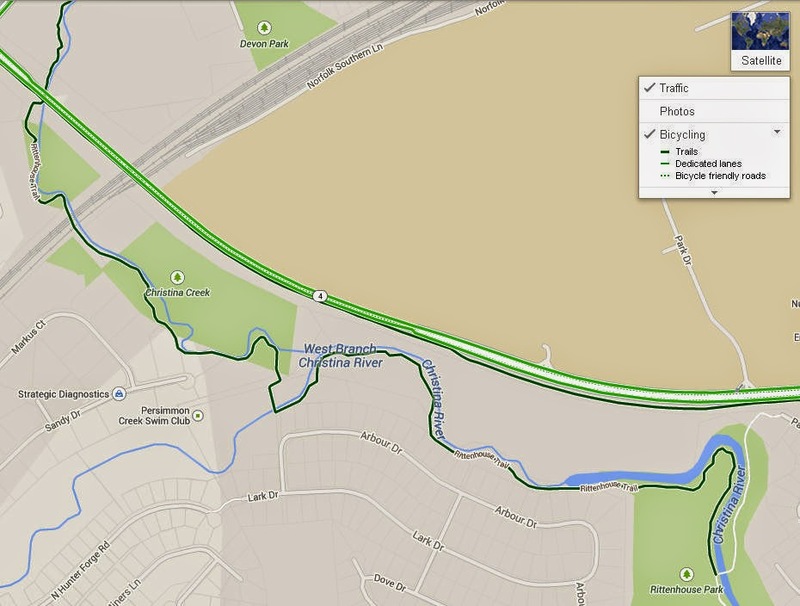 The Rittenhouse Park Trail is supposed to connect between W. Chestnut Hill Road and Elkton Road. However, the video above tells a different story. The trail goes from semi-bikeable to treacherous to non-existent. Featured on Dissent -- On April 10, 2010, four-year-old A.J. Newman was killed just steps from his home. Along with his mother and two sisters, he was trying to get back to his apartment building from a bus stop on the far side of a five-lane highway. As they waited on a narrow concrete median, A.J. broke loose from Raquel Nelson’s hand, following the lead of his older sister, who took advantage of a short break in traffic to dash across the road. A drunk driver struck him dead before his mother’s eyes. From CityLab -- The continued decline in traffic fatalities is one of the brightest trends in public health these days, and according to the latest figures from the National Highway Traffic Safety Administration, it continued in 2013, with the overall number of people killed on roads in the United States down 3.1 percent over 2012 numbers. Far too many people still died on the nation’s streets and highways -- 32,719, to be precise. But that number represents a remarkable 25 percent decrease in traffic deaths since 2004. 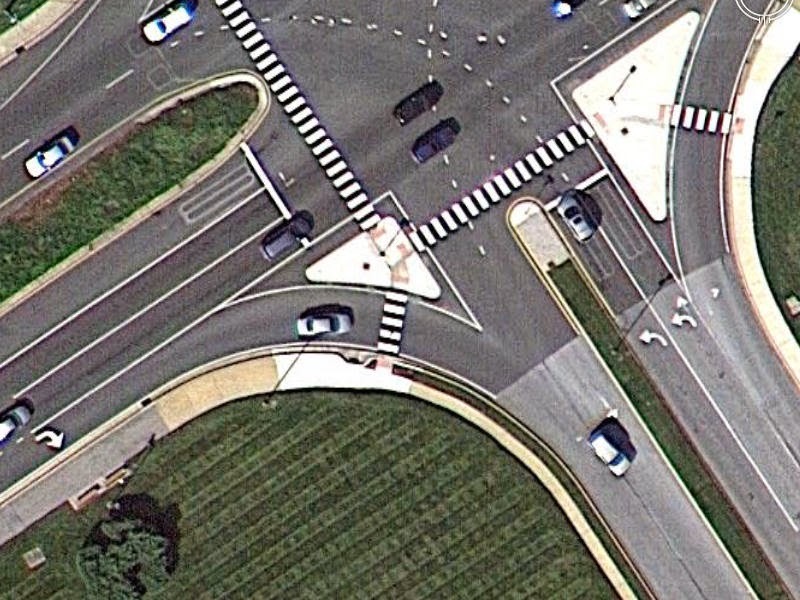 The standard cross-road is nearing extinction in suburban Delaware, replaced by configurations like the above. Instead of right turns in the traditional sense, radius turns keep motor traffic moving as quickly as possible through intersections. This comes at the expense of bicycle and pedestrian safety, since bike lanes seldom fit and the beginning and end of the crosswalk isn't even signalized. Induced to drive faster, motorists seldom yield, and usually just barrel on through even when pedestrians are present. Whether directly related or not, Delaware recently tied its 2014 per-capita record for pedestrian fatalities - enough for 1st place even ahead of Florida one year ago. For a period yet to be determined, http://www.delawarebikes.org will re-direct. If you follow us on Facebook, you will need to open our new page and LIKE us. Our original page will be off-line soon, so try not to delay. 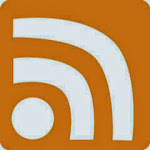 If you follow our posts via RSS Feed, you may need to re-subscribe, or click HERE. Twitter followers should remain unaffected. 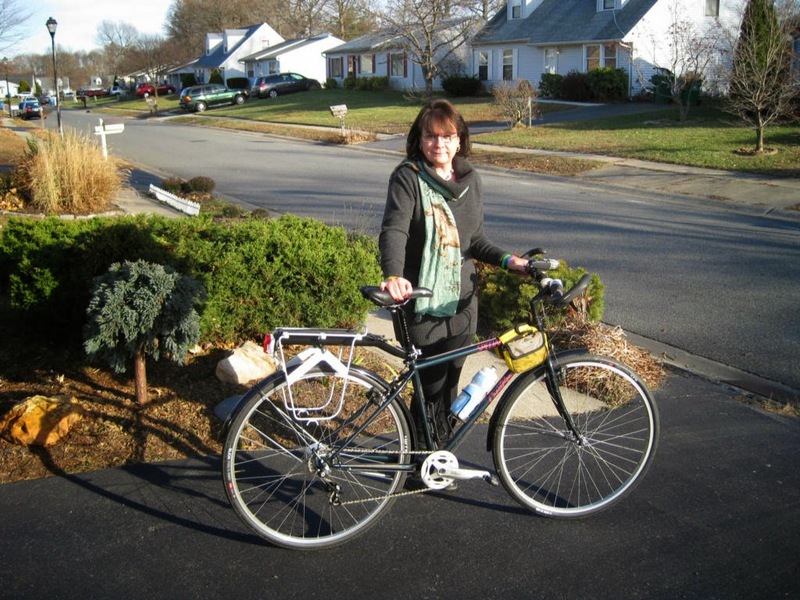 2014 was the first full year of 1st State BIKES (formerly known as Delaware Bikes) existence. It was a year full of challenges, and hard earned successes. Much work remains to be done; 2015 promises at least as much, if not more action. 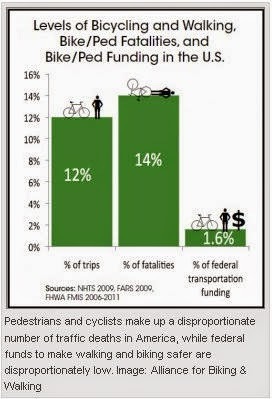 Below we highlight the highs - and a few lows - of the past year in bicycle advocacy. 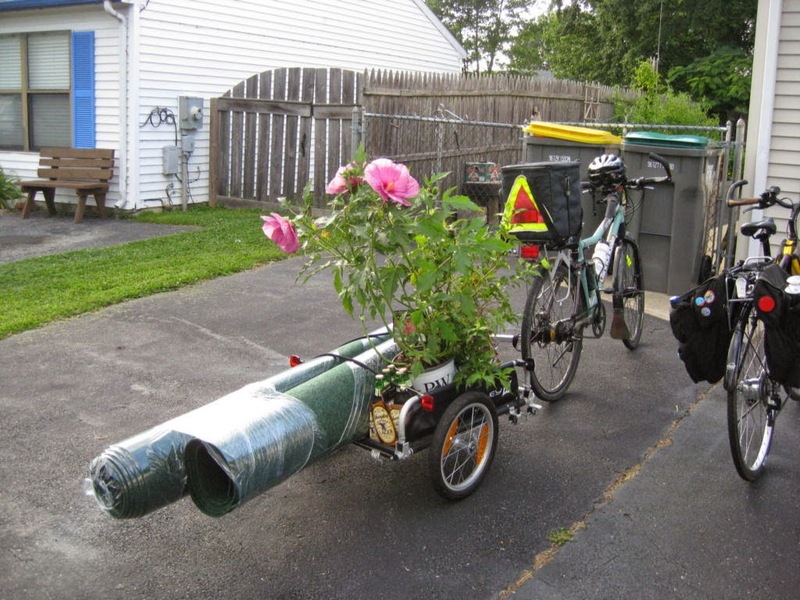 Some are joint projects with the Delaware Bicycle Council and the White Clay Bicycle Club. 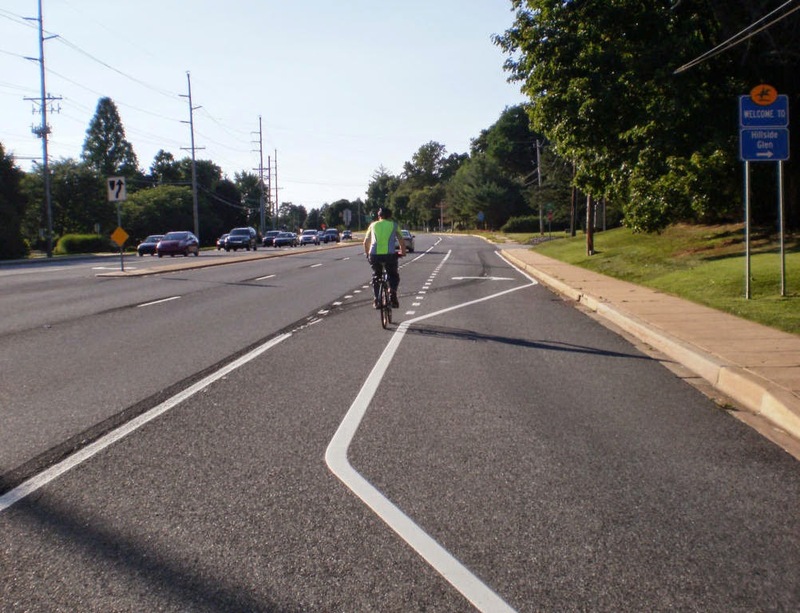 Survey: Is Route 13 in Dover safer with Bike Lanes? 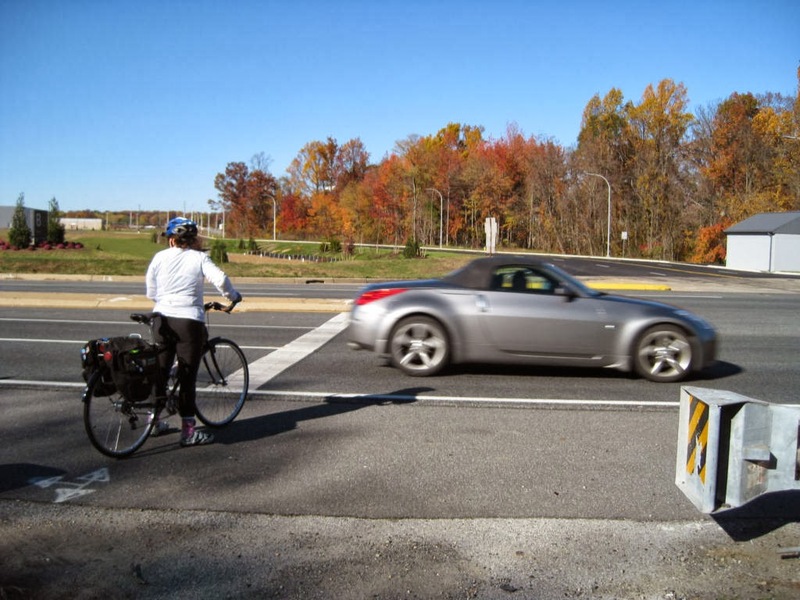 Petitioned DelDOT to upgrade bicycle warning sign to include "On Roadway"
Want to know more? 1st State BIKES is a committee made up of advocates from different organizations that believe in on-road infrastructure and safety. 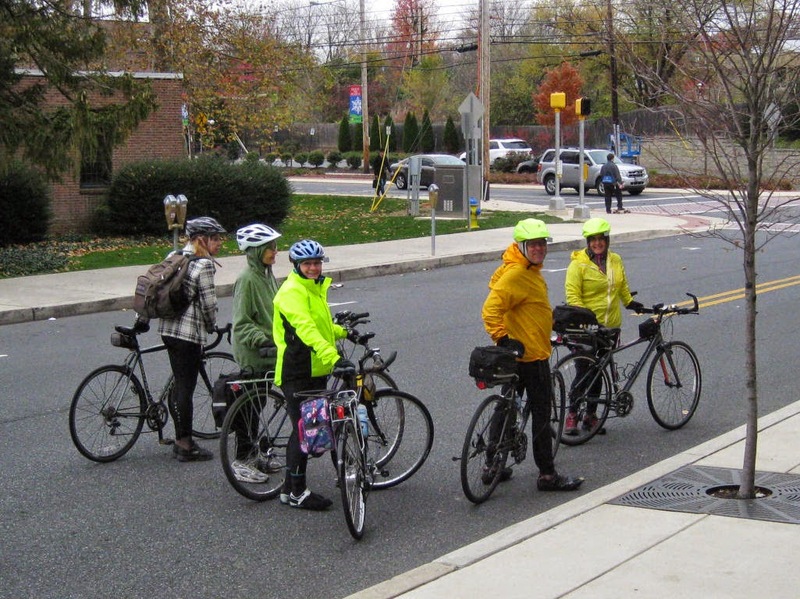 In the quest for a balanced network of bicycle facilities, our advocates also support the surveys, petitions, and projects from trails and pathways organizations such as Bike Delaware, Delaware Greenways, Trailspinners, etc. We also support education, including B.E.S.T. (Bringing Education and Safety Together).